If one journeys down to the northwest corner of Bernardsville, to a road named Hardscrabble, there lies an area where visitors can walk through time. This sojourn is most effectively accomplished on foot, with several places from which to choose to park your car and start your adventure. 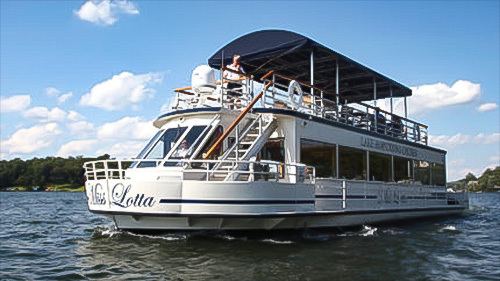 You’d be well advised to bring your camera, too, because the trails that crisscross this area trace through a National Park and a wildlife sanctuary, both of which offer wildlife and landscapes of wooded hillsides, open meadows, and streams. You can expect a hike of moderate difficulty, but, taken slowly, can be done in about three hours’ time. It can also be accomplished in a loop, and, in this case I will lead you in the direction I find to be my favorite. 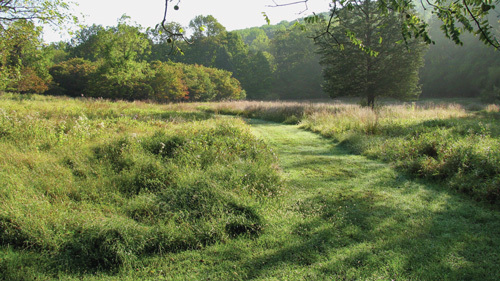 If you walk down the sanctuary’s driveway, you will see a meadow down to your left along Hardscrabble Road. You wouldn’t know it by its appearance, but this was once the location of an historic encampment. During the Revolutionary War, the New Jersey Brigade, commanded by Brigadier General William Maxwell, arrived in this snow-covered field on December 17, 1779, and set up camp to begin construction of their shelters. The men were able to move into their primitive huts, just over the northern hillside on Christmas Day. We’ll pass the hut site later in the hike. At the end of the sanctuary’s driveway, walk to your right up Hardscrabble Road. There is not much traffic; however, it is a narrow, winding road, so be mindful of cars as you walk. Pay attention to the hillside on the northern side of Hardscrabble Road as it relates to various parts of this area’s history. Different layers of the past can be figuratively peeled away in this area, much like an onion skin, to expose many distinct events and the time periods that accompanied them. Approximately 10,000 years ago, the Wisconsin Glacier retreated, depositing large amounts of rocky debris that had been scraped up and collected by the ice. On the sides and ridge of this hill, and almost anywhere else along the Hardscrabble Road area, are huge boulders of granite bedrock. This rock is probably one billion years old, a part of a spur of mountains that runs from Pennsylvania to Vermont known as the Reading Prong, the oldest exposed rock in the eastern United States. Near the very top of this hill, which you may certainly explore on additional trails, are large cuts, pits, and gullies in the earth not congruent with the surrounding slope of the land. They are scars left from the early American settlement of this area, from as early as 1723, when a fulling and textile mill was established and supplied by resident farmers who raised sheep for wool and flax. Through the mid-1800s, this area was known as Logtown, due, no doubt, to the piles of logs that were processed at the sawmills along the brook. It was during the Logtown era that some exploratory holes and cuts were made on the hillside to mine iron ore. Dug largely by hand, the ore was loaded into carts for transport to local furnaces. Blacksmith shops, including one formerly located just across from the entrance to what is now NJ Audubon, fashioned all sorts of products from the resulting iron. Through those years, Logtown contained three sawmills, a carpet-weaving shop (the first stone building you’ll pass on your right), a grist mill, a general store that also served as a Revolutionary War commissary, mechanics’ shops, a fulling mill, a blacksmith’s shop, and Eyre’s Forge, which dated back to the 1700s and was located just across the Passaic River from the meadow you already passed in your journey. The existence of Eyre’s Forge was actually one of the reasons why the New Jersey Brigade decided to spend the winter of 1779-1780 in this area. As time passed, the industrious nature of the Logtown settlement gradually diminished, and the area’s name gave way to Hardscrabble, due to the rocky ground and the difficulty it took to farm it. Take note of the second, larger, and beautifully restored, private home on your right, known today as the Reynolds-Scherman-Dreesen House. I mentioned a general store and commissary in Logtown, and this building was the place at which supplies were sold to the troops. However, the buckles, shoes, belts, and other equipment from this establishment were procured mostly by officers. Built of fieldstone in 1750, it graces the intersection of Hardscrabble Road and Chestnut Avenue. Originally built for Samuel Reynolds, it was later owned by the Scherman family from 1921-1981. Mr. Scherman was the founder of the Book-of-the-Month Club, and the house was used for summer and weekend entertaining of many notable authors and celebrities. 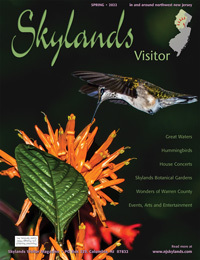 The Logtown area actually retains much of its charm due to Mr. and Mrs. Harry Scherman, who donated land for both the preservation of the New Jersey Brigade site and the beginning of the neighboring Scherman Hoffman Wildlife Sanctuary. The home was later painstakingly refurbished by the Dreesen family. Continuing up Hardscrabble and around a large curve, you’ll approach a bridge. Carefully cross the road just before the bridge and enter the Patriots Path trail through the iron traffic gate. Look to your left. Snaking across both sides of the road runs a stream known as Indian Graves Brook, named for the Native American burial ground that once occupied the wooded slope on the northern and eastern sides of Hardscrabble Road. The Lenape grave sites, which were marked only by wooden stakes, have been lost to history. But the sacred ground, now under the stewardship of the National Park Service and the Audubon Society, remains a quiet, reverent place. Trails crisscross the area, and there are several large rocks at the top of the hill on which one can sit and rest. Continuing up the trail, turn right at the first intersection. In about forty yards, you’ll see two interpretive signs on your left. During December of 1779, George Washington’s army erected more than one thousand, simple, log huts from the area’s six hundred acres of timber, each built to a standard size of sixteen feet long by fourteen feet wide with a peaked roof over walls measuring seven feet high at the eaves. Approximately seventy-five of these huts were erected on this very hillside. 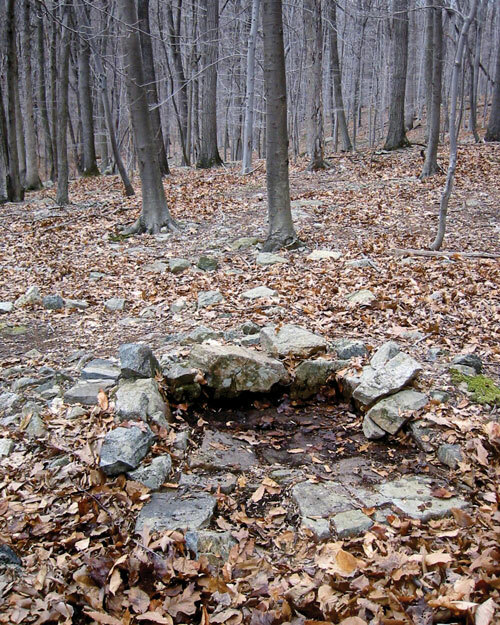 Each hut also contained a stone hearth and chimney where fires were tended for cooking and warmth, and just ahead after the Patriots Path trail bends to the left, you’ll find the site of one of these hearths. It provides one of the most direct points of contact with actual, physical structures from the Revolutionary War in Morristown National Historical Park; yet it is seldom visited, as it is a walk-in site only. Set among the trees are the hearth stones that once contained the fires of two Patriot officers over 236 years ago. It is fairly easy to see where the walls were at this site and get a sense of the cramped living conditions that once existed here. During the winter of 1779-1780, General George Washington had his army encamped in Jockey Hollow while he made his headquarters in Morristown. With no less than twenty-eight snowstorms occurring during the most severe and ferocious winter of the entire Revolutionary War— perhaps the worst of the entire century—up to four feet of snow on the ground blocked supply roads, as the men did their best to provide themselves with shelter and food and preserve their torn coats and tattered clothing. Forced at times to eat tree bark and sleep on beds of loose straw with often only one blanket for every three men, the New Jersey Brigade faced starvation, disease, exposure, and their share of death. Somewhere in the area are even the unmarked graves of two officers among, perhaps, those of the other men that did not survive the winter. Continuing up the Patriots Path, also known as the New Jersey Brigade Trail, a half mile or so will lead past the Cross Estate section of Morristown National Historical Park. On your way, take note of the signage at the base of the steep section pointing the way back to NJ Audubon, as this is the trail you will take on your return trip. The Cross Estate, known as Hardscrabble House during the Cross ownership, was actually built in 1904-1905 by Major John A. Bensel and his wife Ella on 204 acres they had originally named Queen Anne Farm. Following Mr. Bensel’s death in 1922, his wife sold the estate to the Cross family in 1929 who made a few architectural changes to the home. William Redmond Cross, aside from being a successful banker, was the president of the New York Zoological Society and American Geographical Society, and his wife, Julia Appleton Newbold Cross, was a well-known horticulturist. Although Redmond died in 1940, Julia Cross, who was a descendant on her mother’s side of Thomas Jefferson, remained on the estate until she passed away in 1972. In 1974 the estate and the New Jersey Brigade Site became part of Morristown National Historical Park. This Cross Estate now includes a mansion house with beautiful stone, tile, and stucco architecture, mature gardens, and a five-story tower built of stone and wood. The early twentieth century landscape is typical of the Arts and Crafts period and includes a formal perennial garden, an informal garden of native plants, a two-hundred-foot-long wisteria-covered pergola, a Mountain Laurel alley, and a diverse number of tree species. The tower, designed for both water supply and observation, commanded a view that must have been stunning during the early years of the estate, as the trees at that time were approximately half the tower’s height. 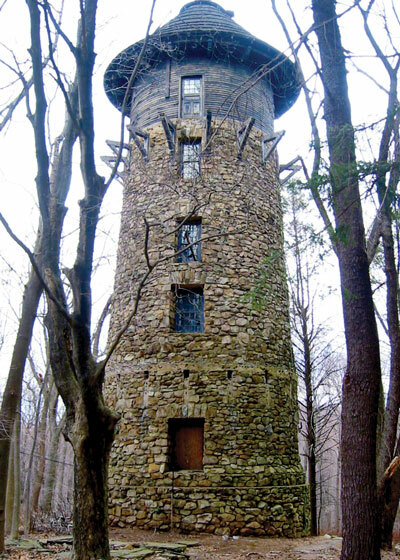 Today it looks odd to have this nonfunctional tower set in the midst of tall trees, but one can still see where the lower and upper observation deck used to attach to its exterior. Missing from the top of the tower is the windmill that once turned the pump to fill a large copper tank at the top of the tower. This tank, in turn, supplied water to the estate buildings by means of gravity. Today, the tower is still the source of water for the estate buildings, but the water is pumped directly to the buildings, bypassing the tank. When I was a child, one of my friend’s father was caretaker of the Cross Estate. This allowed us to roam about the estate and even secretly climb the stairs inside the tower. I can remember the stairs being, shall we say, lacking in stability, and my friend and I literally risked serious injury or death climbing to the top, but we were very young and thought of it as nothing more than an exciting, day’s adventure. The tower is now locked up tight, and I’m not surprised. The serpentine drive that one serviced the estate winds through the thick, established woods around Hardscrabble House, past a chalet-style gatehouse, and down through two granite pillars and walls that flank its terminus at the intersection of Jockey Hollow and Hardscrabble Roads. It doesn’t take much effort to imagine the horses and carriages climbing the drive and carrying their passengers of men donning top hats and ladies in long elegant dresses. Retracing your steps back down the New Jersey Brigade Trail, you’ll come to the intersection you passed on the way up to the Cross Estate. You’ll turn left here and complete your loop following the sign back to NJ Audubon. 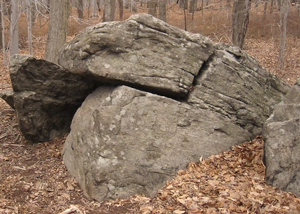 After the first rise and bend in the trail, look to your right, and you will see the large boulders on the ridge that mark the approximate area of the Lenape graves mentioned earlier. 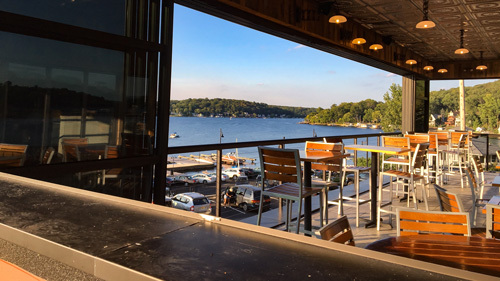 In just a few hours, you will have walked upon land marked by a glacier, Native Americans, Logtown workers, Revolutionary War troops, the landed gentry of the early 20th century, and a wealthy soda manufacturer. Today, the land is preserved for the enjoyment of all. 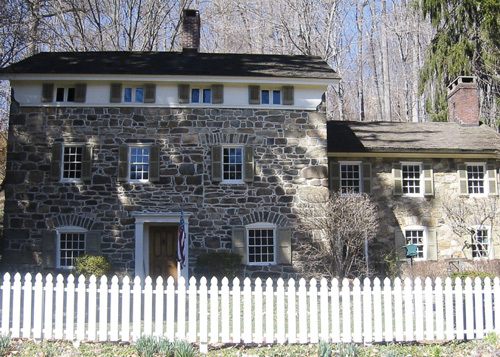 For more information on Morristown National Historical Park and area attractions, check the Morris County Tourism Bureau.